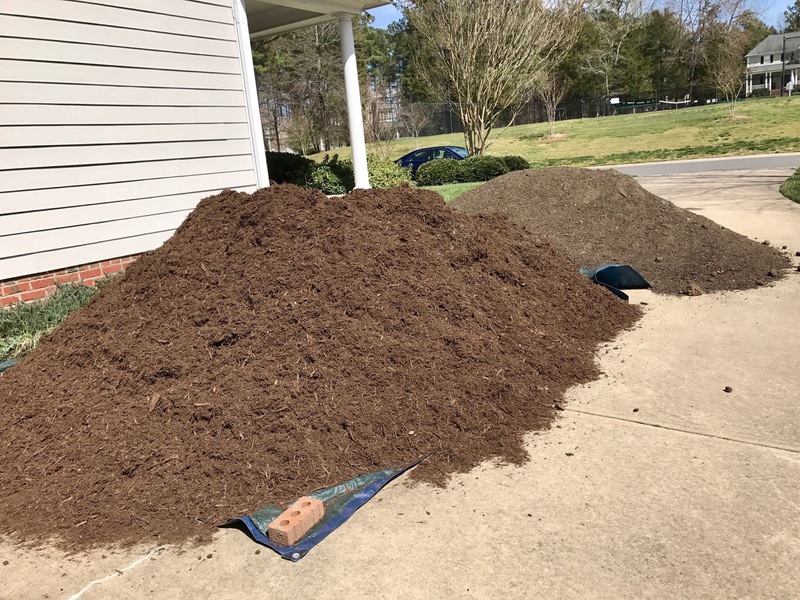 Last Thursday’s delivery included 7 cubic yards of double-shredded hardwood mulch and 4 cubic yards of compost blended with topsoil (50-50 blend). I should have ordered plain compost. The compost blend was a mistake and I ended up giving away much of it to a neighbor. With trepidation I hired assistance this year to help me weed and distribute the mulch. Although I know there were a few victims, such as the Solomon’s Seal I had just recently spotted popping up, but mostly I am pleased and relieved to have this job done. This entry was posted in garden and tagged garden photography, mulch, spring garden on March 29, 2017 by pbmgarden. Winter was a long time leaving and now Summer is intruding on springtime. After a beautiful and warm day, it is 87°F at 7:00 pm. 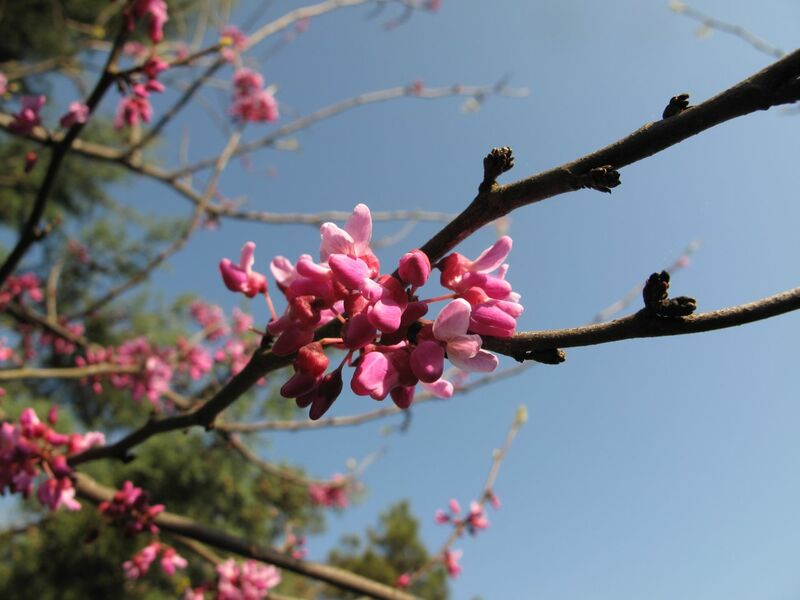 Yesterday the Easter Redbud was opening against the deep blue sky. 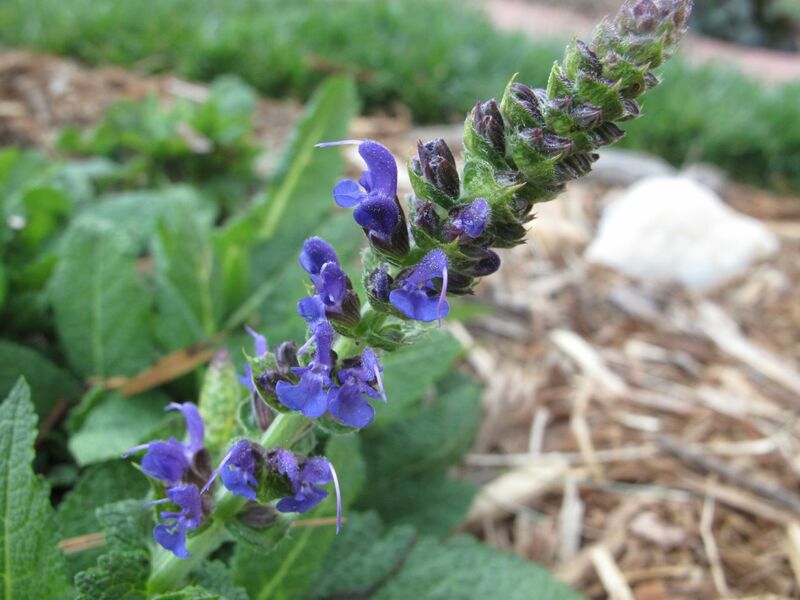 Also yesterday, several spikes of Meadow Sage revealed purple-blue buds. 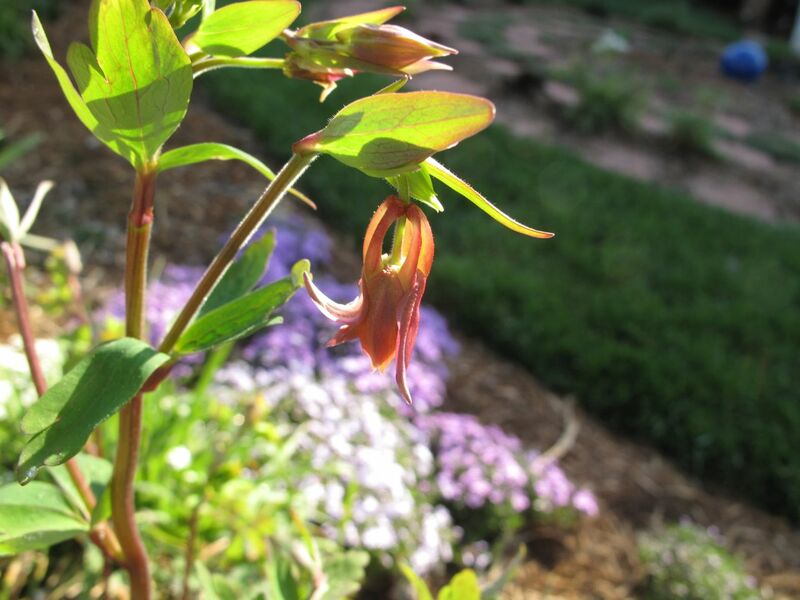 Aquilegia canadensis (Eastern red columbine) was ready to pop open. 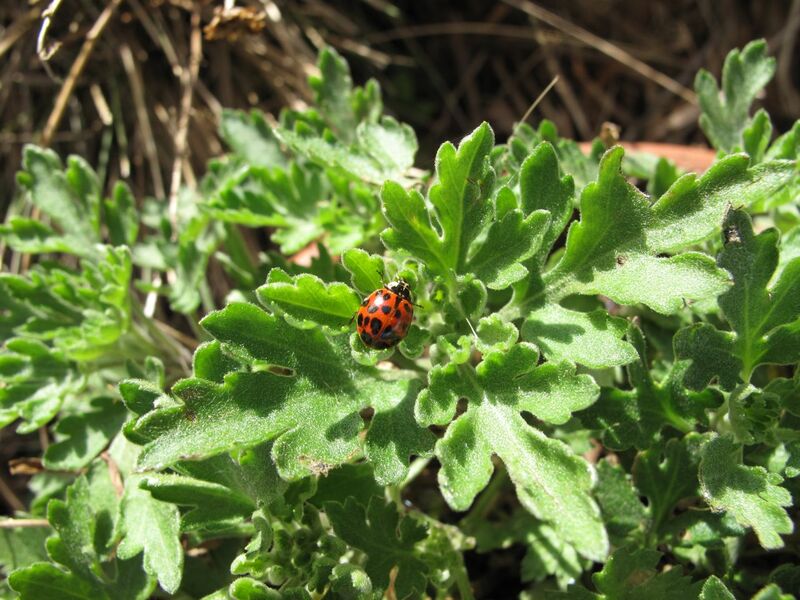 Bumblebees were courting, a yellow butterfly drifted through the garden and a ladybug investigated a chrysanthemum. 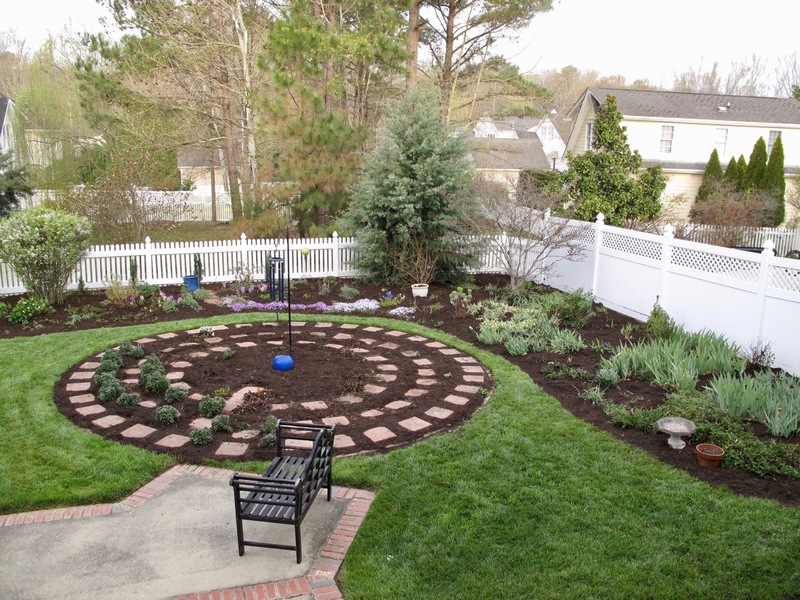 Today the mulch project I began in early February was finally completed! The garden beds have all been weeded. There is still some cleanup to do to thin out some of the most aggressive growers (almost everything in the garden it seems). Nevertheless the garden looks tidier and feels ready for the green, the growth and the surprises that follow winter. And the patio is ready to be reclaimed for something other than mulch storage. 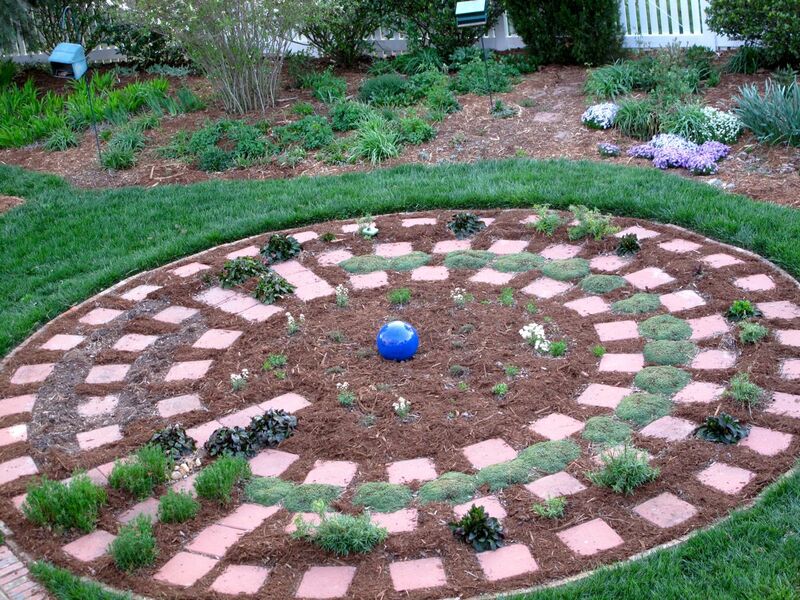 A few new Iberis ‘Purity’ and some Thymus serpyllum ‘Pink Chintz’ have been added to the center of the meditation circle in hope the mulch soon will not even be noticeable. The planting areas between the paths on the left are ready to plant tomorrow. I have used Angelonia there the last two years and it has performed great, blooming until October. It is an annual though and it requires trimming back several times during the summer in order to be able to comfortably walk by. I will try Dianthus year, an not very exciting choice–we’ll see. I ordered new plants from a mail-order company in Michigan in February and finally received them today. I expected them by mid-March, but was dismayed as the shipment dates were pushed back several times. Perhaps the severely cold winter affected the company’s ability to fulfill the order, but now the temperatures here are extremely hot and the plants will need extra care. I will try to get them in the ground early in the morning. This entry was posted in garden and tagged almanac, deep blue sky, Eastern Redbud, garden photography, meadow sage, mulch, nature photography, Spring Flowers on April 10, 2013 by pbmgarden. A week ago I had a large quantity of hardwood mulch delivered to our driveway. I immediately set out to distribute it, one garden cart at a time, around the shrubs in the front and down the sides of the house, before finally bringing the bulk of it to the back where the garden lies. 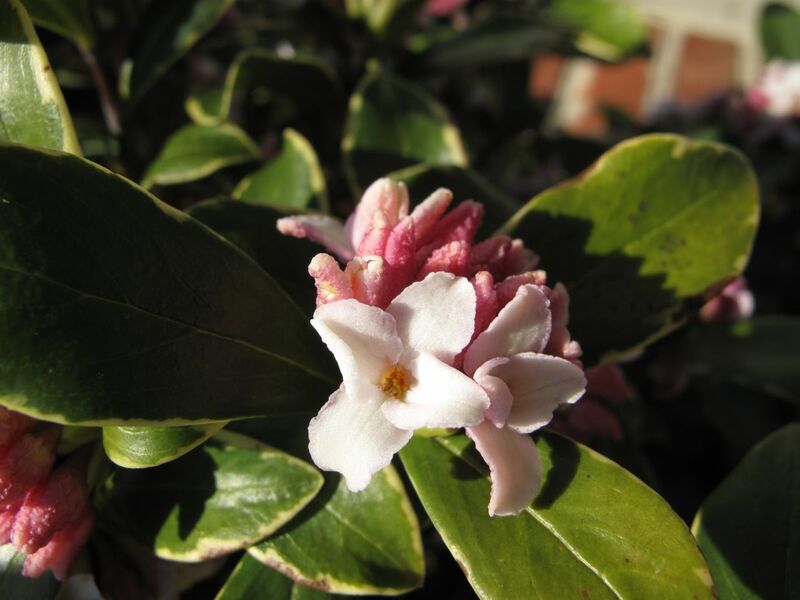 Each day since, as I loaded the mulch into the cart, frequent drifts of lemony fragrance from the nearby Daphne odora ‘Aureomarginata’ (Winter daphne) made me happy and content to be outside. I hoped this job would take just a few days, but secretly estimated it might take a full week. The front and sides are complete. With merely scant work done in the main garden, the project has now gone into serious overtime, but I am enjoying each moment. The side path down which I am carting the mulch into the main garden is tricky. Not well designed for a bulky cart, its slow meander is better suited for viewing Lychnis coronaria and lavender in spring and echinacea and rudbeckia and Perovskia atriplicifolia in summer. As I put down mulch I am also doing some trimming, thinning and putting things in order. I usually forget to prune the ‘Jackmanii’ Clematis, so am trying to include tasks like that in this mulching project. I saved for another day the job of cutting back the Muhlenbergia capillaris (Pink Muhly Grass), but cleaned up many plants, including Hedychium coronarium (Ginger lily) and Canna. A patch of daffodils instantly looked better after mulching. There were signs of new growth from the Baptisia ‘Purple Smoke’ and more daffodils are emerging. A section of stepping stones that lead through the gate were reconfigured, an adjustment that took several hours. 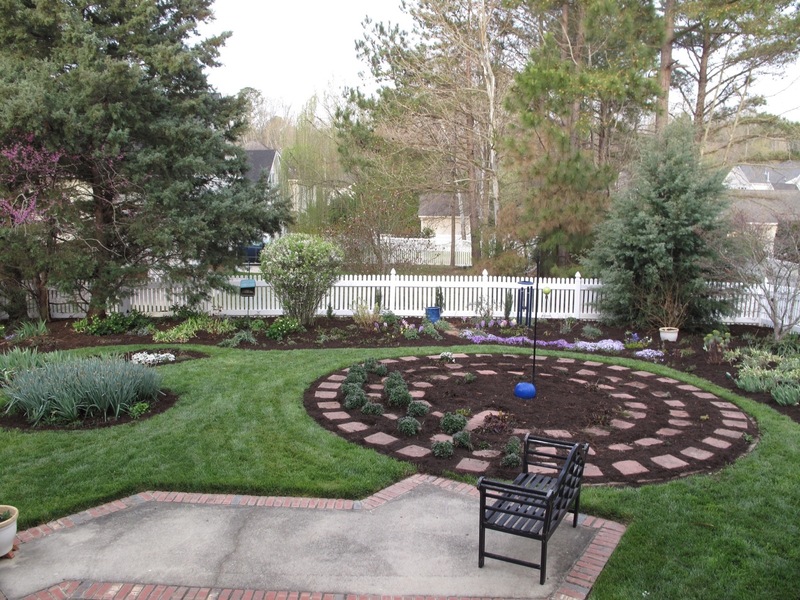 During that time no mulch was being moved, but I was able to salvage some stones for another project. All the while as I worked in this area, the minty scent of Monarda didyma (Scarlet Beebalm) kept me company. On the opposite side of the house, our property is just a very narrow strip where buried gas and electric utility lines run. 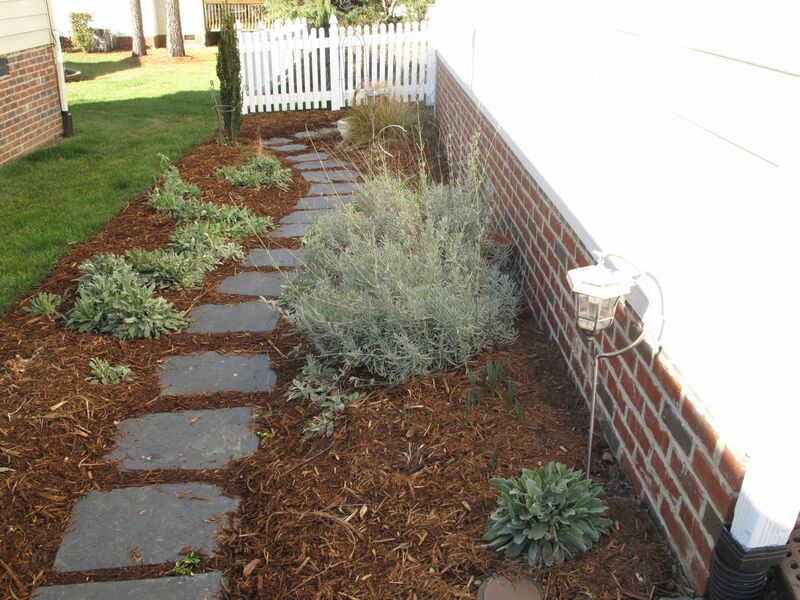 There are few plantings along this side, but new mulch has helped improve the look. Aquilegia canadensis (Eastern red columbine) and an attractive but weedy ground cover, Aegopodium podagraria(bishop’s weed), green it during summer. Last week while mulching there I discovered the first open flower of the winter camellia, Camellia ‘Coral Delight.’ A group of Helleborus x hybridus (Lenten rose) brightens up that spot as well. Over the week I put in one 8-hour day, but averaged 4-5 hours most days. It was cooler and more overcast than expected, but never was I uncomfortable. A friend in the neighborhood volunteered a couple of hours of her time. She brought another cart and loaded one while I carried the other to the back garden, which was a huge contribution. Most neighbors walking by the front of our house though were astonished, often helpfully suggesting I should hire someone to help. Even putting cost aside, no one else has a special relationship with this little piece of earth, nor would know to be careful of the little wonders tucked away in various spots. The benefits are overwhelming for doing this task myself. 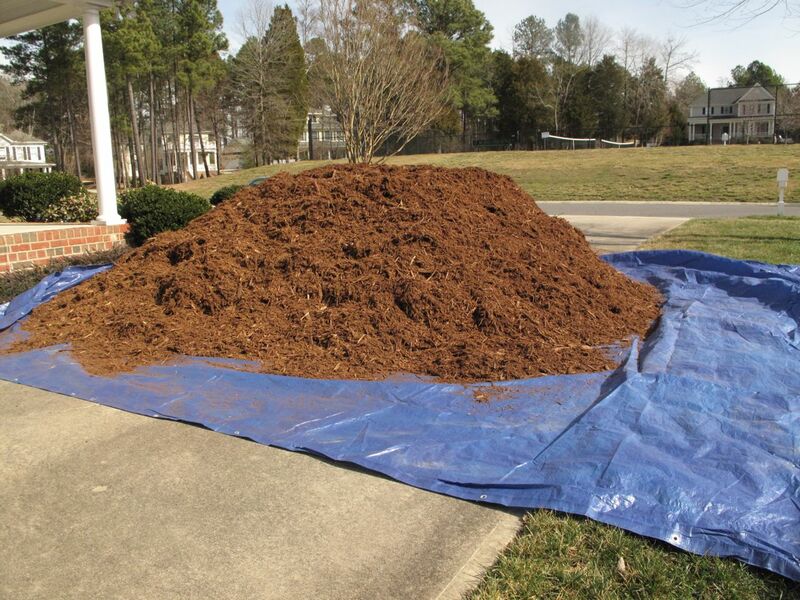 Purchasing the mulch forced me outside after too many days of lingering inside this winter. Moving mulch last week I was so content being outdoors working in the garden, it never seemed like work all. Last week’s weather forecasts of sunny, mild days held true for only a couple of days last week. Most nights were below freezing and it took a while to warm up each day enough for me to want to be outside. Just before the Northeast U.S. had several feet of snow, the storm brought an inch of rain here, leaving the garden too wet to work for a time. Rain fell overnight and continued through this morning. 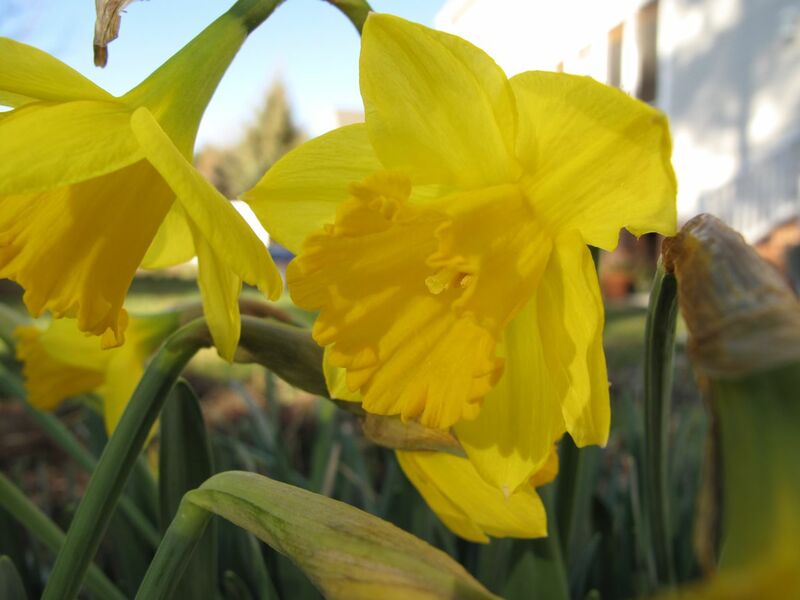 Today’s high will 61F. It will be slightly warmer this week, but overcast, then raining again by midweek. The forecast for this week does not portend well, but forecasts can change. 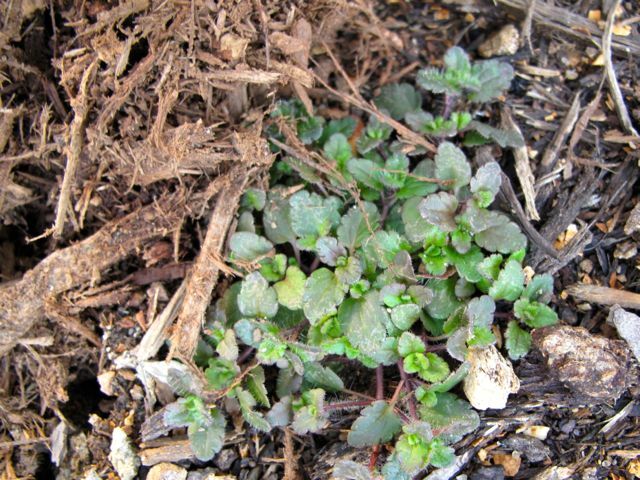 This entry was posted in garden and tagged almanac, beebalm, Daphne odora, mulch, winter garden on February 11, 2013 by pbmgarden. While many American fans were busy watching the Super Bowl last night I made plans for the garden season opener. The weather forecast for the week looks decent, high of 48F today then rising into the mid-50s through Sunday, some sunny days, some overcast, but at least no rain for a few days. This gives me a chance to mulch the garden before the plants get out of hand. 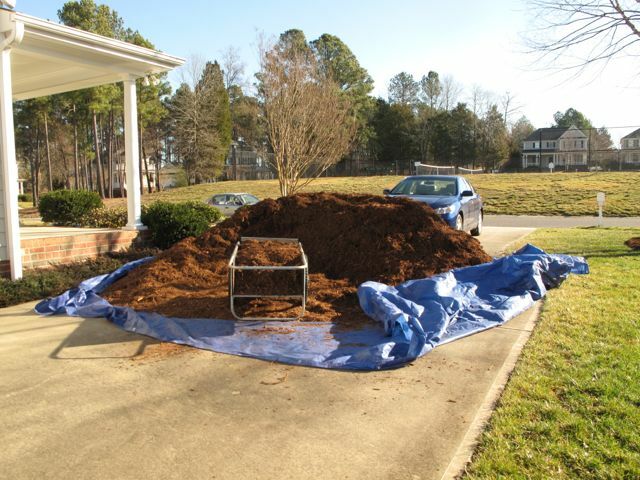 I placed my order at 8:15 this morning and promptly at 11:30 a truck backed into the drive, dumping 14 cubic yards of double-shredded hardwood mulch. Oh my! Last year the garden was never completely mulched so this is a chore I really wanted to do. 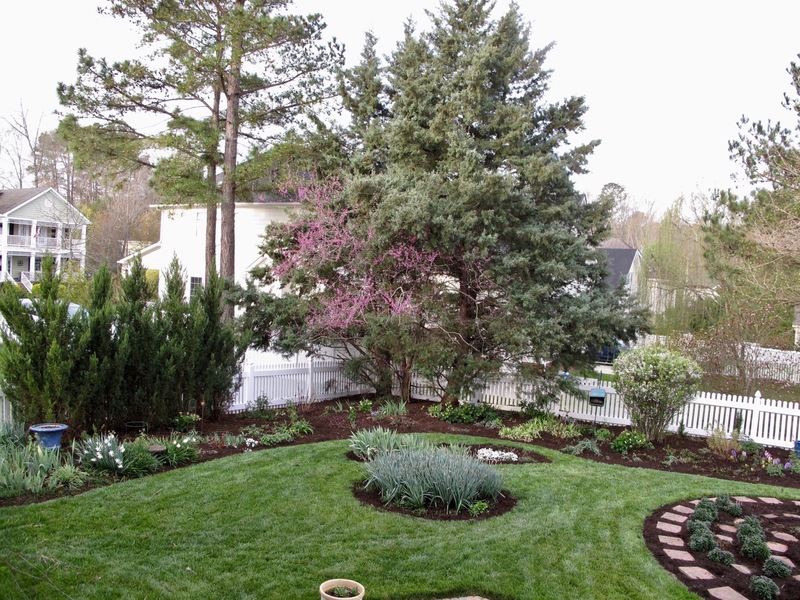 It will be a challenge to get it all spread quickly, as access to the garden is by way of a narrow little path not easily traversed with a garden cart full of mulch. After just a couple of hours I was already in want of a break to rest my back, but as expected, the time spent is rewarding. I am trimming back old foliage and stems from last year and closely inspecting each square inch. Progress will be slow but steady. It took this drastic measure of blocking the driveway and garage access to get me out into the garden. I will not be able to get my car in the garage until I finish this project. Now that I have my playbook for this game, there is nothing left to do but try to win it for the home team. 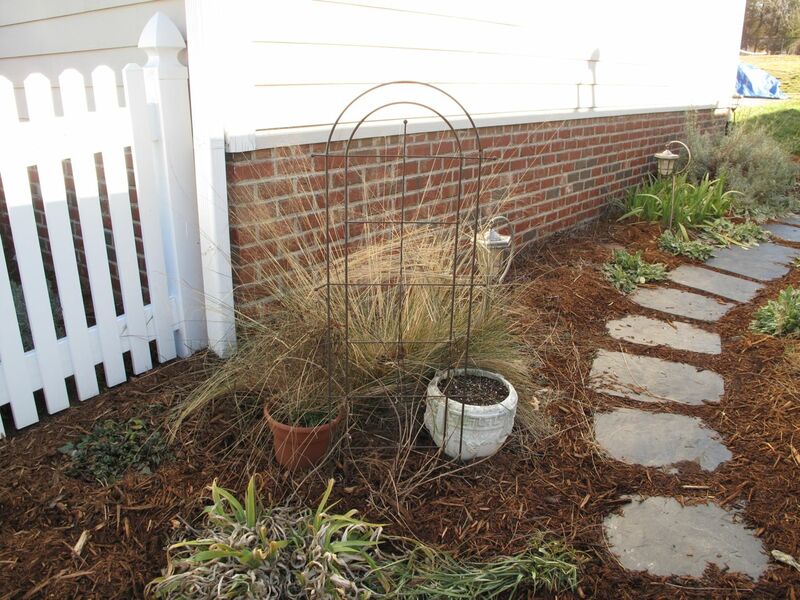 This entry was posted in garden and tagged almanac, mulch, winter gardening chore on February 4, 2013 by pbmgarden.